In case you missed it, November is over. Which means that NaNoWriMo is over. Which means that I don't feel guilty for not working on my novel. Kathy and I actually didn't get very far into our novels--we decided to have a life instead. However, we both did get good starts and somewhat got into the habit of writing. We are going to try to keep it up and finish the things. Keep asking us about them! The past week we had the Aptica Christmas. My boss Jason bought a pedicure and a massage for us. It was very relaxing and soothing. As you can sort of see from the not-so-great picture, I got my toes painted. 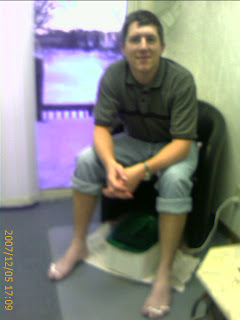 My pedicurist--as well as everyone else, except maybe Kathy--were very surprised. She told me that she has never painted a guys toe nails before, except her dad's and he was asleep at the time.